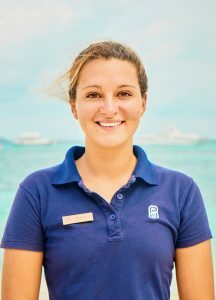 Paige, an enthusiastic diving instructor with broad marine conservation experience, started an initiative of great ecological value back in May 2016: coral gardening outside 5.8 Undersea Restaurant. 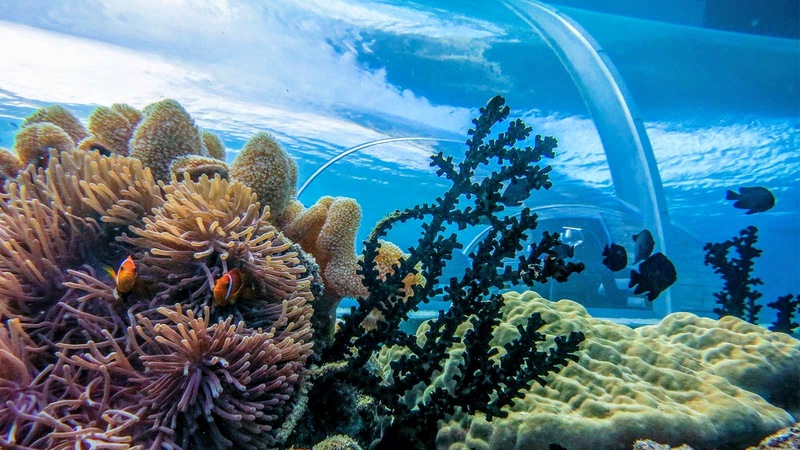 ‘Prodivers and I wanted to create an extension of the existing reef that would represent, on a small scale, the beauty of the Maldives’ underwater while at the same time reviving marine life that had, at the time, been weakened by the El Niño. With a carefully devised plan of action, a team of divers dislodged some blocks of coral that showed few signs of life and placed them onto the shelves surrounding the restaurant. Just one day after the first coral planting was complete, the area was covered with damsel fish, wrasse were feeding in the sand, and pairs of butterflyfish were hovering over the reef. ‘Fish life around the restaurant is nothing short of amazing’, adds Mie Shaahh, a local who was instrumental in the project. ‘Dreams don’t work unless you do ‘- and what a dreamy hustle-bustle of marine life it is! Hurawalhi Island Resort is located inside a reef channel through which nutrient-rich water gets funnelled into the atoll. 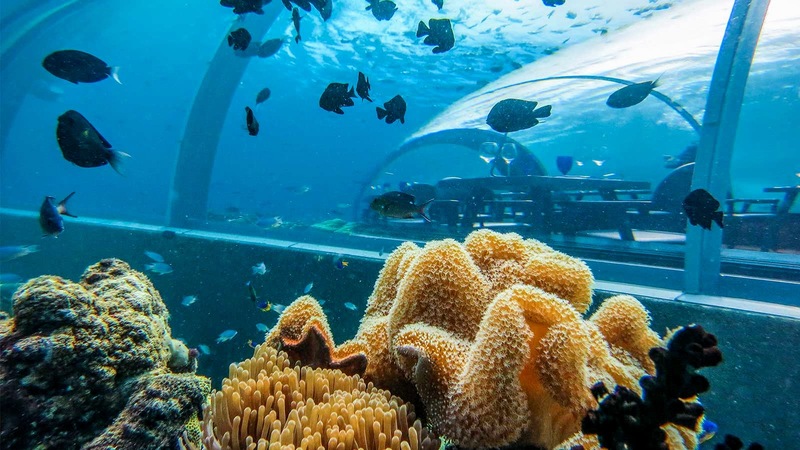 5.8 Undersea Restaurant, in particular, lies in a bay that experiences a constant backwash current, creating a potential for the reefs to thrive. 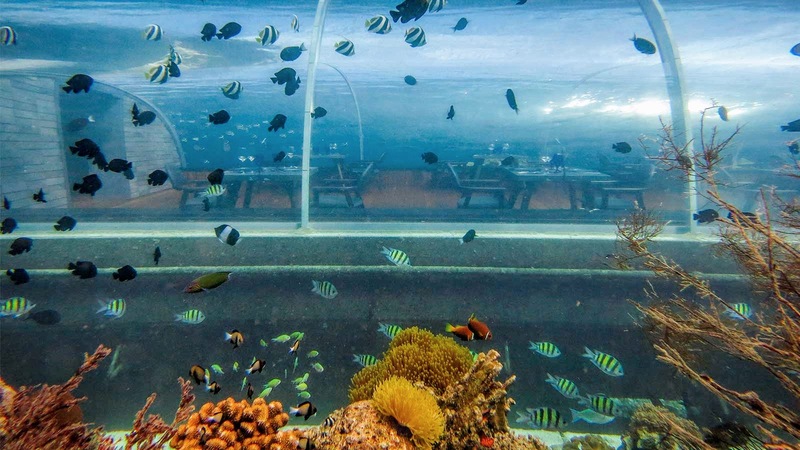 Diners at the world’s largest and deepest undersea restaurant will not only be in for a variety of treats served on their plates, but will also get to admire amazing views of the new coral reef that Paige and the team brought to life. At the moment, you can see more than 100 different species of fish living on the reef, including everyone’s favourite clownfish. ‘Coral bleaching had devastating consequences on anemones. Water temperature of 32 degrees Celsius induced stress on anemones, causing them to release photosynthetic algae they use to create energy into the water.’ Anemones became white and shriveled, but within a couple of days the team noticed that the 20 bleached anemones were turning brown again and within 2 weeks they had become healthy and full with clownfish laying eggs around them. The new location with favourable currents and temperature helped them to regain the algae quickly enough to prevent them from dying. 2 tasting menus and coral garden view, please!